Pathology is an approach to multi-national and multi-lingual pop music. 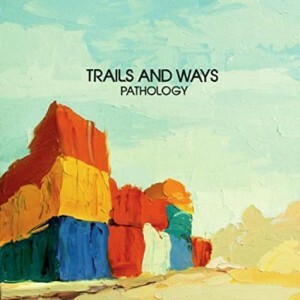 That’s the easy way of saying that Trails and Ways have mystically pulled off the unique blend of 80’s R&B and electronic attributions that indie bands have been attempting for some time. The opening track “Skeleton” is filled with wonderful backing drums, whoop and awe sing-along wordless lyrics, and the evocative image of a “skeleton… dancing at the scene of the crime.” Which is to say that it begins the album in a very fun way, while at the same time reminding the listener that the joy is of course monumental. The skeletons of pop music are rising up in ritual and dancing with glee over the supposed murder. The singles are strong. “Say You Will” adds a Prince-like dance groove, “Mtn Tune” gives the listener a grungier folk ballad, and “Jacaranda” adds to the dying romantic with high pitched keyboards and throbbing guitar riffs. That’s only the first four songs of the album, not to mention the thrilling “Nunca” which again finds a way to utilize higher pitched guitar licks and calming male vocals. Aside from whatever influence is being added by the fact that members have lived in both Brazil and Spain, Latin music is the obvious influence on Trails and Ways’ style. The subtle Pathology is light-hearted and fun. Though the lyrics are often about longing and searching, the style is light and free. The album starts to wrap up around the track “Downright,” another successful blend and adaptation of early R&B with electro-indie-pop.